Posted February 19th, 2016 by ijan & category NEWS & OPINIONS, Uncategorized. The International Jewish anti-Zionist Network was very happy to hear that the student-workers in the University of California system endorsed the Boycott, Divestment, and Sanctions (BDS) call through their local union, UAW 2865. This was the first time a major union – in this case, one representing over 14,000 workers – voted to support the BDS call, an inspiring example of grassroots union-based solidarity. Posted February 15th, 2016 by ijan & category Education and Training. Posted January 17th, 2015 by ijan & category Education and Training, PROJECTS & CAMPAIGNS, Uncategorized. The following are workshops or presentations that IJAN offers on campuses, for movement organizations, and at other public forums. Each can be tailored for particular contexts. IJAN is also excited to train students to present and facilitate. Drawing on IJAN’s extensive report by the same title, this workshop focuses on exposing the role of multi-million and billion dollar funders in repressing pro-Palestine activism in the United States. These funders exist in tight relationships with both the Israeli and US governments, working in tandem to censor and otherwise suppress the Palestinian narrative and pro-Palestine organizing, both on campus and off of it. They also fund a wide array of conservative and neoliberal causes, from homophobia to climate change denialism to the dismantling of welfare and other social protections. This presentation maps some of the key players and driving logic behind this backlash, and points to the ways our movements have creatively and strategically responded with a politics of joint struggle, both historically and in the present. Through the ongoing colonization of Palestine, Israel has developed expertise in repression. Since its founding Israel has collaborated with repressive regimes from Southern Africa to South America and is now involved in the global production and sales of surveillance and drone technology while also training police forces across the U.S. and around the world. Our movements need to address the ways the Israeli government and corporations, often in collaboration with the U.S., contribute to the violence and repression targeting us. The presentation provides the evidence and argument for joint struggle between those working toward Palestinian self-determination and justice for communities and movements across the United States and around the globe. While many Jews, particularly those in the West, support Israel, since the birth of the Zionist movement there have always been many Jews who reject the premise and politics of Zionism. In claiming to speak for all Jews, Zionism denies this history and tries to hide the growing number of Jews who reject the Zionist project. This workshop addresses the following questions: What is Zionism? What is anti-Semitism and how is it misused and manipulated by Zionism? How does Zionism impact Jews? What is the role of anti-Zionist Jews in supporting the struggle for Palestinian liberation? What is the role of anti-Zionist Jewish organizing and perspectives in broader anti-colonial, anti-racist, anti-war, anti-capitalist and anti-imperialist struggles? Posing as an environmental organization, the JNF has played a central role in the on-going displacement of Palestinians since 1901. This workshop exposes the JNF’s “green-washing” – using the guise of environmentalism to perpetrate land theft, environmental destruction and colonization, and introduces the international Stop the JNF Campaign. What is Anti-Semitism? What is Zionism? How have Zionist institutions used the pretense of fighting Anti-Semitism to undermine struggles for liberation? Why is Zionism a continuation rather than a departure or effective response to anti-Semitism? 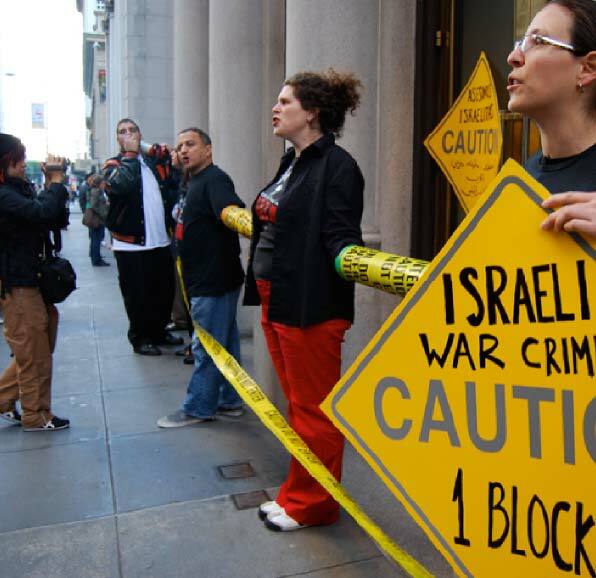 How do Zionism and Israel accept, use, reflect and reinforce anti-Semitism? This workshop will provide arguments against false claims of anti-Semitism and opportunities to practice challenging these claims. Anti-racism is an ethical imperative and strategic necessity for all of us committed to struggling for collective liberation. This workshop highlights opportunities for joint struggle against various forms of racism, including anti-Arab/anti-Muslim racism. The workshop identifies Zionism as a racist ideology and movement that founded and continues to support the Israeli apartheid state and colonial project. We argue that meaningful anti-racism necessitates an uncompromising commitment to anti-Zionism. We’ll discuss how the BDS targets we choose, internal dynamics and the messages we use can connect justice for Palestine with other liberation movements. This workshop challenges the misuse of the Nazi genocide of Jews (“The Holocaust”) for political purposes. By exceptionalizing the Nazi genocide, European Jews are set apart from the victims and survivors of that and other genocides instead of being united with them. The Zionist exploitation of this genocide to justify colonization, displacement and apartheid in Palestine is a dishonor to those who survived and those who did not. The refrain “never again” must mean never again, for anyone. Building off of anti-Muslim and anti-Arab racism and stereotypes, Israel claims to be a safe haven for Palestinians queers and other Arabs. In contrast, Israel is a great threat to Palestinian queers and other queers in the region who are subjected to occupation, military attacks, a siege and other consequences of Israeli colonization and militarization. This workshop provides an overview of the history and use of pinkwashing, an argument of the importance of challenging pinkwashing for the movement for justice in Palestine as well as for queer liberation, and provides examples of challenges to pinkwashing by queer activists in Palestine, the larger region and across the globe.